When I meet people and they find out I work in water, they always ask me this question: When are we going to run out of water? Arizona legislators - particularly those who were just elected - have the same concerns and questions about the state's water supplies. Many of these lawmakers from both urban and rural communities attended AMWUA's legislative forum on December 7th to get answers. 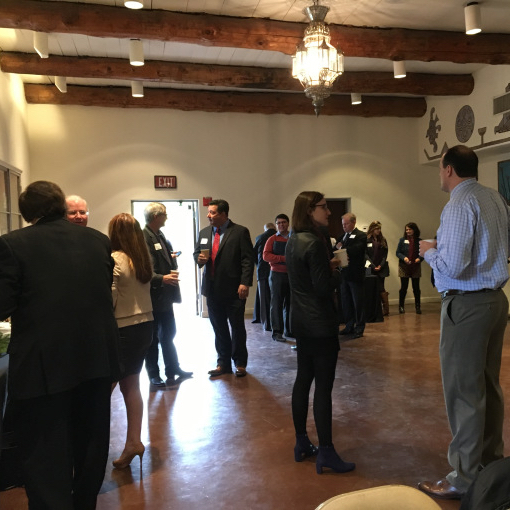 AMWUA assembled leaders from the Arizona Department of Water Resources, Central Arizona Project, Salt River Project and the Arizona Chamber of Commerce and Industry to make sure legislators have the latest and best information. Here's some of what the legislators learned. Arizona is one of the most successful states in the country at managing its water resources. We have never shied away from the fact that we live in an arid place. Since our water supply is limited, out of necessity we have managed it very well by wringing out every drop. Despite a 17-year drought, Arizona is not in a water crisis and the state has planned for extended drought. Much of the credit goes to Arizona’s forward-thinking leaders who passed the 1980 Arizona Groundwater Management Act. Among other things, this law regulates wells in the state’s most populous areas, requires a 100-year assured water supply before development, and helps to save water in the state’s aquifers for the future. The Act also motivated AMWUA to create a regional water conservation program. As a result of this regional effort and municipal water conservation programs, water demand in the Valley is the same today as the late 1980s despite a rapid increase in population. AMWUA member cities want to ensure the strong foundation built by the Groundwater Management Act is always strengthened by new legislation and never—intentionally or unintentionally—weakened. Despite our successes, there are challenges ahead for us to overcome. Valley cities are supplied mainly with water from the Colorado, Salt and Verde rivers. These rivers are experiencing drought that is affecting state water supplies. For example, flows in the Salt and Verde rivers are down by 35 percent. The rivers are suffering from over-pumping in rural areas not regulated by the Groundwater Management Act and from catastrophic wildfires in overgrown forests where the rivers’ originate. Furthermore, the AMWUA cities also receive almost 40 percent of their water from Lake Mead, a reservoir behind Hoover Dam on the Colorado River. The water level in Lake Mead determines if and when the U.S. Secretary of the Interior will declare an official Colorado River water shortage. Without continued conservation efforts, there is a 50 percent chance of a shortage declaration in 2018, which would reduce Arizona’s available supply. At the forum, the Director of the Arizona Department of Water Resources, Thomas Buschatzke, assured legislators the state is working with cities, farmers, industries and Native American communities to reach an agreement to keep more water in Lake Mead and prevent a shortage declaration. If a comprehensive agreement can be reached in time, Director Buschatzke said he would present the plan to state lawmakers for their approval during the 2017 legislative session. A successful Arizona plan is key to Nevada and California agreeing to plans that would protect Lake Mead on a larger scale. Arizona Chamber CEO Glenn Hamer told lawmakers that he supports Director Buschatzke’s efforts. He also called for the same kind of arduous negotiations and political will that created the 1980 Groundwater Management Act—this time to create a plan that protects our current water supplies in all three rivers. “We may be at the point where we’re going to have to come together in a bipartisan fashion to protect the state,” Mr. Hamer told the forum. He named water as one of the Chamber’s top three issues. “Water security means economic security,” Mr. Hamer said. The AMWUA cities have worked hard to help Arizona remain a leader in water management. As a result, the Valley has grown from a dusty outpost into a major economic growth center. But wise water management isn’t just for the AMWUA cities. Water is a statewide concern. Rivers and aquifers do not recognize political boundaries. What happens in one part of the state can have a ripple effect in other parts. We are in this together, whether we reside in urban or rural Arizona and whatever our political affiliations. So here’s the answer to that pervasive question from all water users, whether or not they have the power to make laws. When will Arizona run out of water? We will run out of water when we stop planning, managing, and investing in it.